Mannargudi Mallinatha Swamy Jain Temple is an ancient temple built during the Chola Dynasty in the twelfth century in the small town of Mannargudi in the Tiruvarur district of Tamil Nadu. 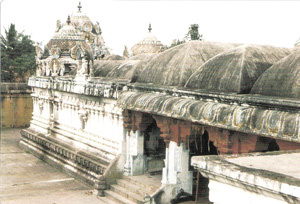 This is one of the most famous ancient Tirthas of Tamil Nadu and the main idol worshipped here is of Bhagawan Mallinathar. The other idols that are being worshipped include the idol of Saraswathi devi, Jawalamalini Amman, Padmavathy Devi and Dharma Devi. The main festival that is celebrated over here is known as “Kannadi Pallku”. It is celebrated in the summer season for around eleven days . It is believed that in this festival Sri Jawalamaini Amman gives Darshan the to all the devotees. This is the only temple in Tamil Nadu where this festival is celebrated. On the day of Akshayatritiya and on the third day of the Thai month every year, another festival is celebrated in this temple with great pomp and show and it is known as Urchav for Shri Adhinathar Urchav Murthi. In this festival a street procession is organised. Many other rituals like fasting are also practiced by the Jains during the Asthami, Chaturdashi and the full moon days as these days are considered to be most auspicious for performing certain rituals and religious observations. The Jain women take food only after taking the name of the Tirthankaras for about five times. After completion of this ritual, religious books are distributed to the devotees. Many Jain people take food only after the sunset and before the sunrise considering it to be a holy practice.